The access and visit to the Army Museum as a group will be granted provided that a proper booking has been made. These visit requests must be processed at least with 15 days prior to the intended date of visit using the “ARMY MUSEUM GROUP VISIT REQUEST FORM”, e-mail museje.grupos@et.mde.es . The visit will be confirmed by the Army Museum through the “VISIT RESERVATION” document. 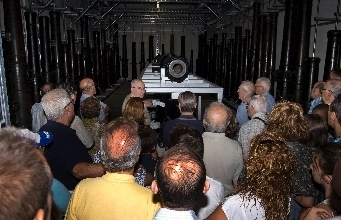 • The entrance fee for the visit of groups will be determined based on the number of group members and taking into account both the provisions of the “Order DEF/2599/2011, of September 21st, that regulates public visits, the rate charged for the use of spaces and the Army Museum entrance fees”; and the possible specific agreements established for the promotion of tourist visit in the Army Museum. • Access for group visits may be on foot or by vehicle using the access on Union street or walking through the main door of the De la Paz street. When accessing using collective passenger transport, this will arrive to the groups lot (East Lot), members of the group will get off there and the transportation means will leave to return and pick up the group members, if necessary, ten minutes prior to the scheduled hour for the end of the visit. • In order to facilitate complying with the timetable of the groups visit accessing the Army Museum at the same day, the group shall be reunited in the groups’ hall 10 minutes before the start of the visit. • To access the Museum accompanied by a guide, this should be in possession of the accreditation of Tourist Guide (issued by the Autonomous Region of Castilla La Mancha or the province of Toledo), with the exception of education professionals, government officials or any other person acting in the service of the Public Administrations, as well as personnel working for the Museum under legally established conditions. • Each group will have a group leader who will represent the group for the purpose of the visit. This person shall identify himself/herself in the control access and in the groups’ hall. The group leader will hand over the “VISIT RESERVATION” document and will come along with the staff of the Museum to the ticket office in order to purchase and collect the tickets. • In the interests of safeguarding the collections and the capacity of each hall, the visit to the halls will take place in small groups whose number will vary depending on their characteristics, and will be determined and regulated by the staff of the Army Museum. • During the visit, the group or group fractions in which the group has been divided shall walk together and follow the instructions of the Museum staff.